Have another question? Please leave a comment. What does “Chaakri” mean and how does SA Ni SA make a difference? The word ‘Chaakri’ means service. At Chaakri Mahila Gruh Udyog, we train rural and tribal women in manufacturing ‘khakhras’ (roasted wheat crisps) of different varieties. The Khakhras are vacuum packed to retain the original taste and freshness. Shramik Naari Sangh (Sa-Ni-Sa) is an organization that strives to unlock and nurture the talent of contemporary and less privileged women to build a gender inclusive society for economic growth. Sa-Ni-Sa aims to promote entrepreneurship for women who utilize their skills and train them to scale newer heights and create opportunities to attain financial independence. What are the unique features of our product ? They are totally hand rolled and machine finished. 100% whole wheat flour is used to prepare all types of khakhras. .
No white sugar is added in any khakhra. Our product is made under strict supervision, following stringent hygienic measures. Our khakhras are compliant with the statutory food grade packaging and licensing requirements. Khakhras are brittle and prone to breakage. We provide vacuum packaging, which makes them virtually unbreakable during normal handling and thus minimizes wastage to zero. What are the different khakhra flavors? How are product quality standards maintained? ✓ Every new hire is inducted through a systematic procedure covering elements of hygiene and significance of adhering to pre-set quality standards. They are then given extensive training in rolling and roasting khakhra for several weeks. A tenured ‘buddy’ is assigned to each of the new hires, to mentor them through the process while they master the art of khakhra making. Supervisors monitor quality on an on-going basis at various stages of the production cycle. Thus, we are able to maintain high quality standards. ✓ All our recipes are created by our in house specialists and are fine-tuned by experts from the industry. ✓ Senior members of the team are entrusted with the task of ensuring that raw materials are received, cleaned and stored well. ✓ Specialized personnel are trained on dough preparation to maintain consistency in the taste and quality of the product. ✓ We have a dedicated Quality Audit team that inspects the texture, colour, thickness and size of the khakhra before packing it. Our khakhra is vacuum packed to retain freshness of the product for a long duration. ✓ Vacuum packed khakhras have a long shelf-life, with the original freshness and taste remaining intact. ✓ We are PETA certified too. Which stores carry the “Chaakri” brand? 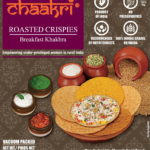 Chaakri Khakhras are available in many countries including USA, India, Dubai, and United Kingdom. Do you ship if Chaakri Khakhras are not available near me? Do you accept credit cards ? How do we order online ? Our team will review the order and get back to you with updates. Orders are shipped within 2-3 business from USA distribution center. We accept all major credit cards. Hi, what type of oil does the.chaakri use? I see refined vegetable oil but what type? Thanks for asking. The vegetable oil we use is high grade palm oil. Unlike some other khakhara brands, we never use refried oils of any kind for our products. Our khakharas are made using pure and best quality oil.